Fat Cat Creamery's Sarah Johnston and Dylan Rodriguez show off her creations featured for Chocolate Heroes Month. Photo by < a>White Beard Photography. On Sunday, February 10, 2019 from 1 to 3 p.m., visit Fat Cat Creamery at 1901 North Shepherd for a special tasting event showcasing the work of owner Sarah Johnston. The event is sponsored by Callebaut, maker of a wide range of fine chocolates chosen by top pastry chefs around the world for its consistency and high quality. 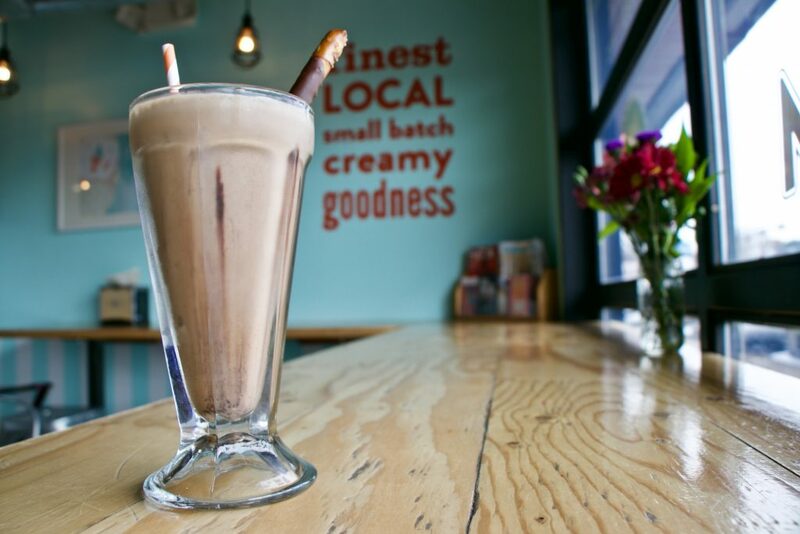 For the event, Fat Cat Creamery is serving its iconic Milk Chocolate Stout ice cream as well The Dude Malted, a malted milkshake made with Milk Chocolate Stout ice cream, peanut butter, malt powder and garnished with a chocolate-covered pretzel stick. Both treats are also available for all of Houston Chocolate Heroes Month, which runs through February 10. During the event only, all of Fat Cat Creamery’s treats made with Callebaut chocolate are buy-one-get-one-free — so bring a friend! Johnston’s dream of starting a craft ice cream shop in Houston’s Heights neighborhood started when she realized there wasn’t one already. She says ice cream is her favorite food, so this was a solution for satisfying both her cravings and her creativity. She worked on Fat Cat Creamery in the evenings —introducing people to their ice cream at special food events — while maintaining her day job at a prominent commercial property management company. It took two-and-a-half years to make the dream come true, but Fat Cat Creamery’s storefront opened in December 2013. The Dude Malted is one of two decadent creations Sarah Johnston will be serving in celebration of Chocolate Heroes Month at Fat Cat Creamery. Photo by White Beard Photography. Johnston prides herself on using the best ingredients for her ice creams, including milk, eggs and fresh fruit from local farms. She sought out excellent chocolate as well. “I’ve been using Callebaut since first starting Fat Cat Creamery,” says Johnston. “We use the milk chocolate in our Milk Chocolate Stout ice cream and also the white chocolate on a regular basis. We always have it in-house for doing one thing or another.” Fat Cat Creamery even makes its own toppings and chocolate-dipped cones. Sustainability is a focus of the Callebaut brand — and for Fat Cat Creamery as well. The shop’s ice cream pints and single-serve packages are made of leftover wheat straw and while spoons are manufactured with of environmentally friendly materials, such as bio-plastics and cornstarch. Callebaut’s marketing manager, Miriam Madrigal, said that the Bayou City was a natural fit for the company’s Chocolate Heroes promotion. 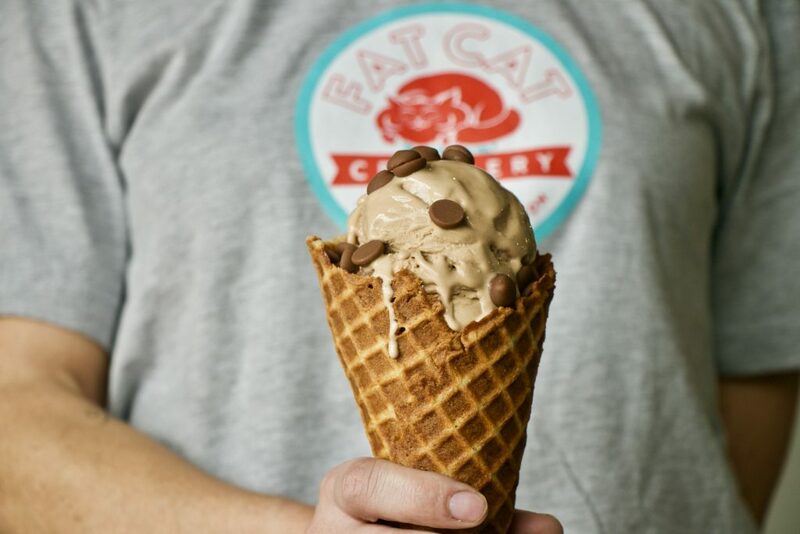 Rich and velvety Milk Chocolate Stout ice cream makes an appearance at Fat Cat Creamery’s celebration of Chocolate Heroes month. Photo courtesy of Fat Cat Creamery. 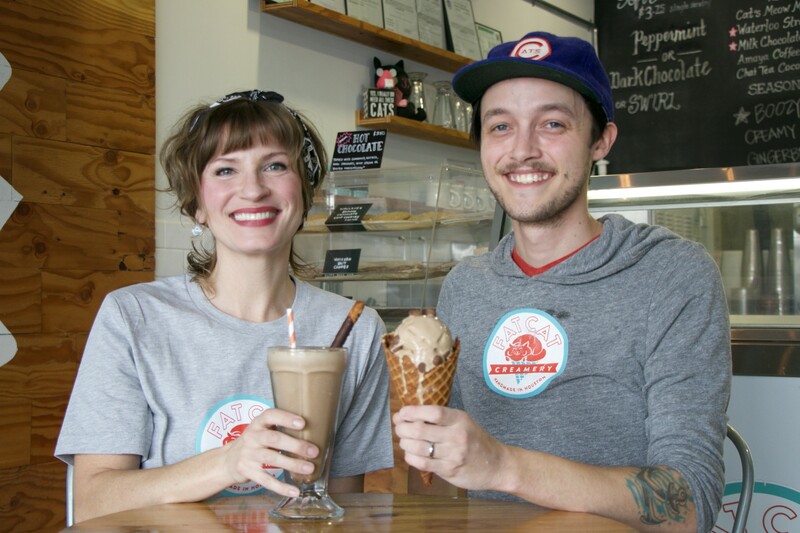 Fat Cat Creamery is one of eight independent Houston businesses featured during Houston Chocolate Heroes Month. Click to view all the Houston Chocolate Heroes on a map. Visit any of them to pick up a Houston Chocolate Hero Month Passport and collect a sticker for each of the treats throughout the month. Once you’ve collected all eight stickers, use the attached, pre-stamped envelope to mail the passport and receive a FREE Chocolate Heroes apron!